Want to learn about Jungles? Read on and enjoy our fun jungle facts for kids! Find a wide range of interesting information that will help you understand what a jungle is and why they are so unique. Jungles are overgrown with wild tangles of vegetation and dense forest. Jungles and rainforests are similar, but while rainforests have thick canopies of tall trees that block out light, jungles allow more light in, making it easier for plants to grow. The extra light creates dense areas of plants and vegetation that can be difficult to navigate. Jungles are often found surrounding rainforests. 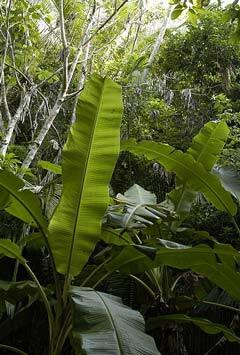 Jungles are home to a wide range of plants and animals. Over half of the world's species live in a jungle environment. Jungles are usually in warm places with high rainfall. The word ‘jungle’ comes from a Sanskrit word meaning ‘uncultivated land’. The saying “The Law of the Jungle” comes from Rudyard Kipling’s collection of stories called The Jungle Book, published in 1894. While lions have the nickname “The King of the Jungle” they typically live in savannah and grassland. Tarzan is a famous fictional character who is raised by apes in African jungles.